Please note that the content of this book primarily consists of articles available from Wikipedia or other free sources online. 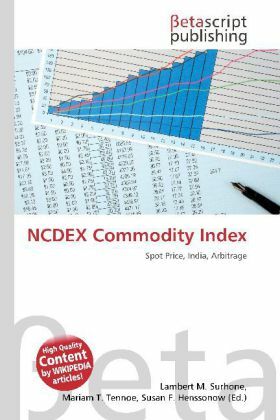 The NCDEX Commodity Index is an equal-weighted spot price index of 20 agricultural commodities convering different groups such as oils and oilseeds, fibres, etc. It is the first such index to be launched in India. Based on the components of the spot price index, NCDEX also displays the national index futures- essentially, the no-arbitrage price if one were to buy futures on the spot index. This price is derived by tracking the futures prices of the index components at the same weightage as the spot index. Currently, index futures are not allowed in India under the FCRA (Forward Contracts Regulation Act, 1952), which requires compulsory physical settlement of futures contracts.